Dec 10, 2016: Super Speed USB Port Bandwidth Exceeded? Jan 23, 2017: Simple wiring question dealing with 4 pin connectors from power supply. Jul 14, 2017: USB 3.0 card. Is the expensive one with 4 controllers/4 connections worth it? Jul 29, 2017: I bought the recommend USB expansion but I still do not pass the Oculus ready test. Aug 19, 2017: Can you see if my build is good? If not, help me make it better please. Dec 09, 2017: Dash update says I need to update my Driver for my Inateck USB hub...but there is no update. Mar 28, 2018: What issues will I experience with an Etron USB controller? May 07, 2018: Got a good deal on 1080 ti, now what? 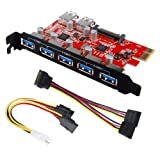 Dec 10, 2018: Will this USB card fit into my build? Dec 21, 2018: [Help] Will my PC handle VRchat with vr? Jan 01, 2019: I am having trouble getting my Lenovo Explorer to work. Jan 08, 2019: Unsure whether I am able to use this expansion card on my MoBo.